You've got a pretty good technique, you can make the sounds in exercises, but what happens when you put them into the song? How DO you make that leap? Our 2014/5 Survey of singers and singing teachers showed that your top three concerns were "Breathing", "Range" and "Taking Vocal Technique Into Song". 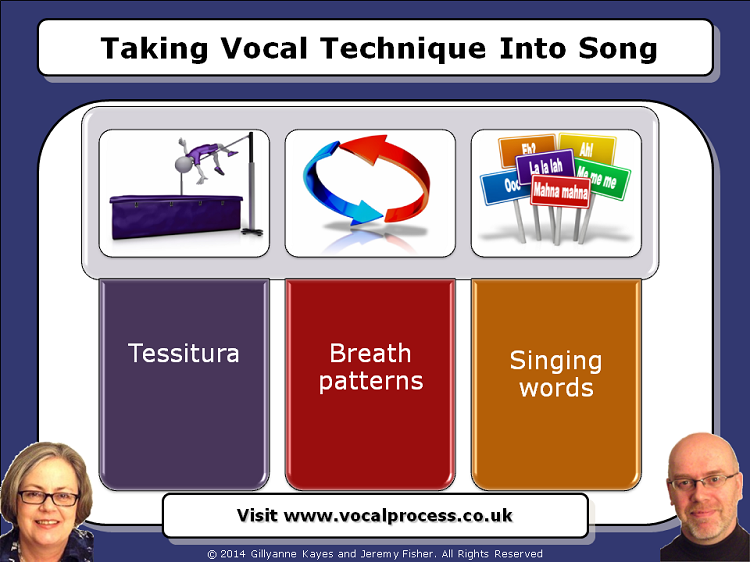 We've already covered the first two topics in Webinar 16 (Troubleshooting Vocal Problems - Breathing!) and Webinar 17 (Troubleshooting Vocal Problems - Range!). So in this hour-long online voice training webinar on Taking Vocal Technique Into Song we explain the difference between technique and song, and list four things that a song definitely ISN'T! By the end of this training seminar you'll understand the key concepts that will help you learn (and teach) songs quickly. So you can put your heart and soul into the performance. Step 1: The Webinar Handout: As soon as your Webinar order goes through, you’ll get an email with confirmation of your purchase. The email will have a download link for you to click. This is time-limited so make sure you click on it and download the PDF Handout straight away. Step 2: The streaming video: Once you've downloaded the PDF Handout, open it and click on the link on the first page. The streaming video will appear in a new internet browser window. Click on the video to play or pause, and hover your mouse over the screen to see the chapter menu. It's that simple. So, if you really want to improve your singing, and increase your vocal troubleshooting skills, add this online singing training Webinar to your shopping cart now and stay ahead of the game!